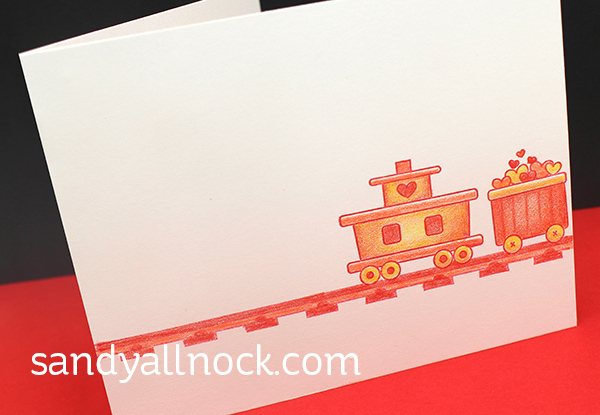 I saw this little train set from Taylored Expressions and right away, wanted to color it with pencils. Since my technique is time consuming, backgrounds are challenging – but sweet little images are perfect for it! And I’m also showing how to make a pop-up sentiment…hope you enjoy the process! Watch the video below, or click HERE to see it in HD on YouTube. 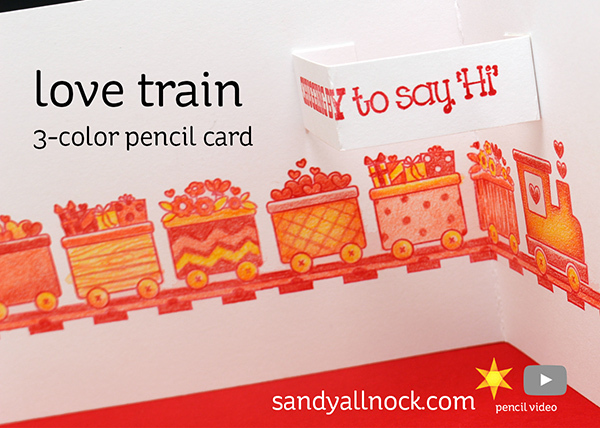 The outside of the card is a simple one – two train cars, rolling down the track. Colors used: Spanish Orange, Pale Vermillion, Scarlet Lake. 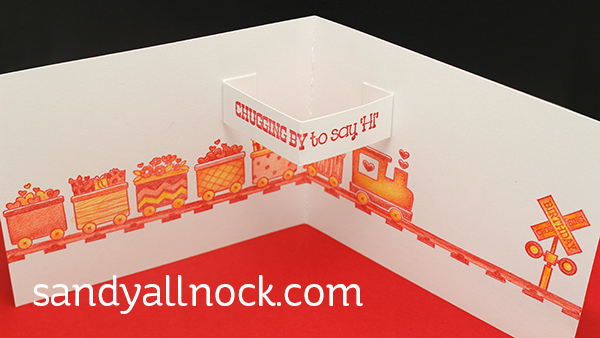 Open, the card has a fun dimensional sentiment peeking out…and a perfect spot between the train and the sign to write a little message! Super cute and I love the 3 pencil idea. The orange really makes these cars glow. I know one little guy that would love for me to make a train full of these for him to play with. Gotta get busy! Oh my goodness, I need that train set. Super cute! An awesome card Sandy! Love your coloring, the layout of the card and the video. I always learn so much from you. Love the variety of colour you have achieved with just 3 pencils. Having the design carried over from the front to the inside is such a fun idea. So cute and colorful and all with three pencils! Thanks for the video. It does help to watch your technique in action, again and again! Awesome. I can feel the love you put into this card.